Septime is "well worth the trip," says Alexander Lobrano. It’s peony time in Paris, and we have a big vermillion bunch in the living room, and some ivory-colored ones in a smaller vase on the kitchen table. Everytime I trot out of my office to make a cup of tea or rustle up some lunch, these flowers swing a winsome punch of pleasure, too, and this is exactly what I experienced the other night over dinner at young chef Bertrand Grébaut’s new restaurant Septime in the 11th arrondissement. While established chefs sometimes rest on their oars, fledgling ones are often like puppies in their eagerness to play and please. To be sure, Grébaut is a considerably experienced cook, having worked in the kitchen at Alain Passard’s Arpege for two years, also at Joel Robuchon, and most recently at L’Agape, a pretentious and overpriced place in the 17th arrondissment that I never cottoned to, but his cooking still exhibits a delicious earnestness and a sincere desire to delight. This atelier style dining room is a great looking space, too, with an artfully tarted up post-industrial decor of work-bench lamps, an open kitchen, tables made from recycled wood and beautiful neo-Danish modern arm chairs. Though I really didn’t take to the white Dinavolino, a ‘natural’ wine by Giulio Armani–who knows, maybe I actually like sulphites, and one way or another, this tasted like a children’s drink gone off, the welcome was warm, there was a great crowd in the room, and the service was prompt and charming. Grébaut reboots his short menu almost daily, but is obsessively committed to working with the best seasonal produce and also does smart and slightly seditious riffs on the Escoffier cannon he had to master as a young chef. A perfect example were the wonderfully crunchy white asparagus with an oyster-spiked sauce gribiche that I had as a first course (Bruno won’t eat white asparagus because he said he was subjected to many over-cooked soggy plates of same as a de rigeur part of first-communion lunches when he was little)–the iodine in the bivalves at once brightened and softened the acidity of the sauce gribiche, with trout eggs and artifully chosen herbs adding witty gastronomic punctuation to this deeply considered and carefully composed composition. Bruno loved his coteaux (razon-shell clams) in a light vinagrette with a shower of fresh herbs, too, and they were perfectly cooked (sous-vide?) so that they remained tender and juicy. If I wasn’t wild about the aperitif wine, I loved the Serbian white (the sommelier explained that it’s produced by a French couple living there), the first wine I’ve ever had from that country and a polite but square-shouldered pour that went well with our main courses–chicken on a bed of lentil puree with grilled baby onions for me, and cod with green asparagus for Bruno, both dishes were cooked impeccably, beautifully garnished, but possibly in need of more assertive seasoning to temper their choir-boy sweetness. Charmed by both the food and the atmosphere at this great new restaurant, Bruno and I shared a homey dessert–a financier like bar of cake with fresh strawberries, elderberry ice cream and strawberry sorbet. And so the meal ended as it had begun, with another delicious cameo of the irresistible sincerity of a young chef trying very hard to make his mark and very much succeeding. If you go for dinner instead of at noon when they serve a reasonably priced lunch menu, the prices at Septime are hefty just shy of expensive, and for anyone who’s ground-zero in Paris is Saint-Germain-des-Pres (mine isn’t, but old habits die hard), this location is decidedly outlying, but as someone once said, it’s well worth the trip. Septime. 80 rue de Charonne, 11th, Tel. 01-43-67-38-29. 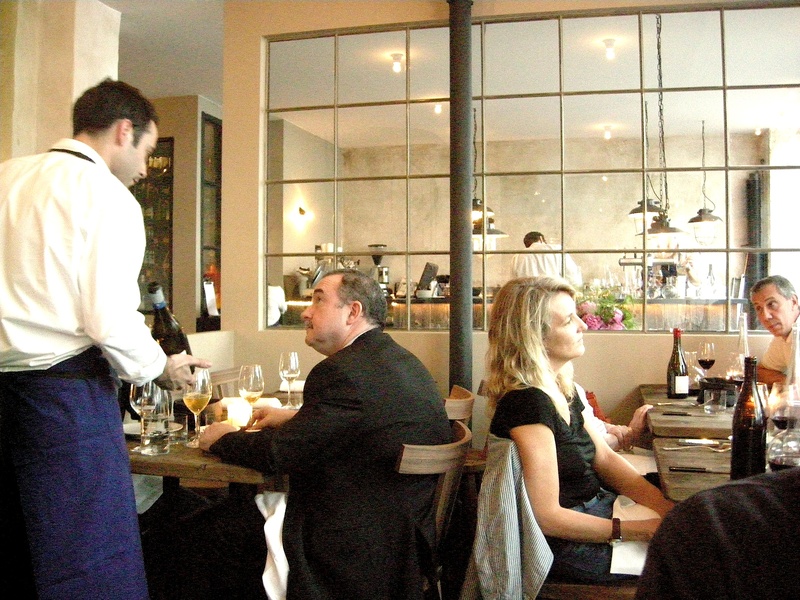 Metro: Faidherbe-Chaligny, Ledru-Rollin or Charonne, Open Tues-Fri for lunch and dinner, Saturday dinner only. Closed Sunday and Monday. Lunch menus 21 Euros, 26 Euros, Average dinner a la carte 50 Euros.